Shopping guide for Italian travel! Maybe, like me, you are dreaming of an Italian vacation in the fall. And along with the terrific food and wine, cultural experiences, and history surrounding you, Italy has plentiful shopping, with its own specialties you can take home as reminders of your treasured travel memories. Shopping overseas can feel risky. Is the cameo a phony? Is the leather price a rip-off? Is that blown glass really from Murano? Laura Morelli has help for you, in her newly updated (2019) 3rd Edition of Made in Italy. You can check it out here on Laura’s website, or order from your favorite retailer. Don’t want to haul a book around with you? Get the e-reader version, and you can have the book on your phone, an easy reference while you’re out shopping. I met Laura at a Historical Novel Society conference a few years ago, and we share a love of Italy and historical fiction. We still cross paths occasionally, whether in the online world or in person, and I’m always happy to hear about her travels and writing successes. Take a look at Made in Italy. And enjoy your Italian travels! Some of you kn0w, from earlier posts, that I think the ancient ruins of Pompeii are fascinating, and a “must see” for visitors to the Italian south. I have been there twice, and would not hesitate to see it again. And now, in fiction, the ancient city can come alive for you in the 2014 novel A Day of Fire. The story (I should say “stories”) takes place in Pompeii on the day of the disastrous eruption of Mount Vesuvius in 79 A.D., following the interwoven lives of several characters. Many are actual people who lived in Pompeii, some known by name and some only by the remains found as the city has been unearthed in the last 150 years or so. A few are fictional characters. All are brought to vivid fullness by the author–and here I really must say “authors” because this is a collaborative novel written by a team of six novelists: Stephanie Dray, Ben Kane, E. Knight, Sophie Perinot, Kate Quinn, and Vicky Alvear Shecter. 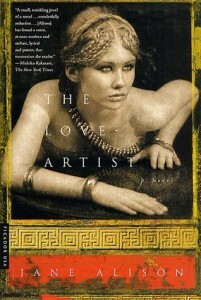 I don’t often read Roman era historical fiction, but was intrigued by the collaborative writing to begin with. Then the ‘anchor’ character drew me in, the teenage Pliny the Younger, whose writings provide the only eyewitness account of the disaster. Throw in some gladiators, prostitutes, senators, reluctant brides, pregnant women… Their fast-paced stories carried me through to the end, when the city is only a heap of steaming rubble, soon to be lost for more than 1,500 years. While each author focused on one or two primary characters in the six sections, the cameo appearances of characters highlighted in other parts of the book made for fun reading, and the urgency of the disaster drove me on, wondering if and how any of them could escape. I recommend this book to you! And please comment when you’ve read it to let me know what you think. Tino and the Pomodori by Tonya Russo Hamilton builds an engaging children’s story around the growing, harvesting, selling, and eating of home-grown tomatoes. Equally engaging is the introduction of simple words and phrases in Italian. Tino works eagerly with his grandfather to plant and tend their tomato garden. The life cycle of tomatoes is described in the course of the story, from planting seeds taken from the previous year’s tomatoes, to celebrating the harvest at the end of the season. 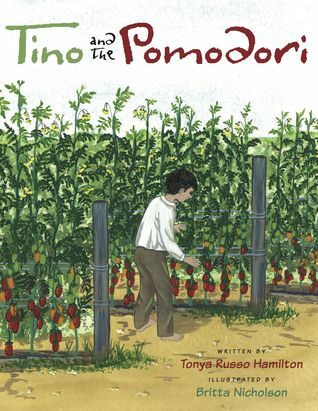 Hamilton takes a more practical than scientific approach to growing tomatoes, so don’t expect a botany lesson–but sit back and enjoy Tino’s excitement, and the loving guidance of his grandparents, as they grow and eat their delicious pomodori. The watercolor illustrations by Britta Nicholson are simple and rustic, suited to the story. The book is just out this month (June 2014) from Gemelli Press, and would make a lovely gift for a budding gardener or a young Italophile-in-training. This is Hamilton’s second book. She wrote Wrestling with the Devil with her father, a memoir of his immigration from Italy and wrestling/coaching career. See my review here. Tino and the Pomodori is also adapted from her father’s early life in Italy. Susan Van Allen’s love for Italy has taken her from the knobby toe of the boot to its mountainous cuff, and this guide delivers a kick in the pants to get you planning your own next adventure there. 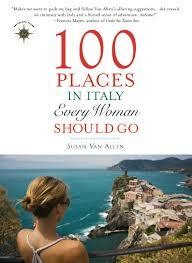 100 Places in Italy Every Woman Should Go is in its second edition, and is certainly not limited to women’s interests–but it reads like listening to your girlfriend’s advice on what made her trip to Italy so fantastic. In another sense, it’s a great reference book because it’s divided into practical sections, sections like “The Divine” (Italy is full of that! ), Gardens, Beaches, Indulge Your Tastebuds, and Shopping. Other sections inspire you to actively engage the Italian culture, including Active Adventures, Cooking Classes, and Learn Italian Crafts and Culture. And with many chapters, Van Allen includes advice on where to eat, or places to stay, to make your visit a “Golden Day”, one of those travel experiences you’ll never forget. Van Allen incorporates the advice of other Italophile writers, too, and includes appendices on travel, budget, and packing tips. There are frequent tips for recommended reading, and references to helpful websites throughout the book. “My favorite coastal hike is the Sentiero degli Dei (Path of the Gods) above the Amalfi Coast. Here steep paths, that were once used for mules to bring goods to the mountain villages, take you through lemon groves, forests, and vineyards. You get great views of the candy-colored villages below that stretch out to the tantalizing sea horizon. I’m glad I bought the book in e-book version. It will be easy to take with me on my next adventure to Italy! Last year I enrolled in a MOOC. What’s that?? A Massive Open Online Course, and there are thousands of them out there, taught by university professors, completely free, and just about any topic you can imagine. I chose a course on historical fiction, and one of the assigned readings was The Love Artist, featuring the Roman poet Ovid. The subject intrigued me because Ovid was born in Sulmona, one of my favorite spots in Italy, and I wondered if his hometown played at all in the story. In that, I was disappointed. I’m not much of a student of ancient Rome, so cannot judge the authenticity of Alison’s depiction of the setting. Her prose is lyrical and lovely, appropriate to the time in language, and evokes a mystical sense that works with the story, which re-imagines Ovid’s inspiration for his (now lost) tragic play Medea. Enchanted by Xenia, a mysterious woman he meets on the shores of the Black Sea, Ovid returns with her to Rome, where his writing career and personal life are bound up with Emperor Augustus and his family tumult. 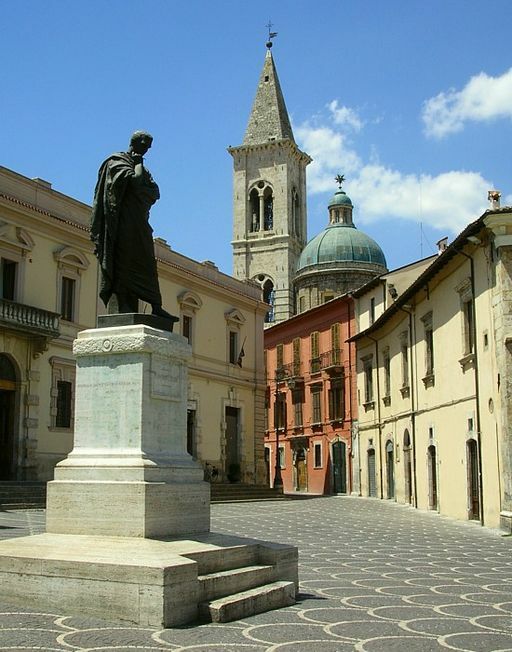 Statue of Ovid in Sulmona, Italy, his birthplace. Image from Wikimedia Commons. The story itself is very slow-moving, and I’m not convinced that Alison took advantage of the natural drama in the story she tells. Not a book that would keep me up reading until two or three in the morning. Perhaps readers who thrive on stories of the Roman Empire would find it more engaging. I’d be interested in the opinions of others who have read it, so please comment below! I sometimes (ok, often) have insomnia, and last night when I woke up at three, I opened my Nook and continued reading a novel I have carried around a lot the past few days, snatching a few pages here and there. At about 5:15 a.m. I closed the Nook and breathed a great sigh of satisfaction, having finished the book. 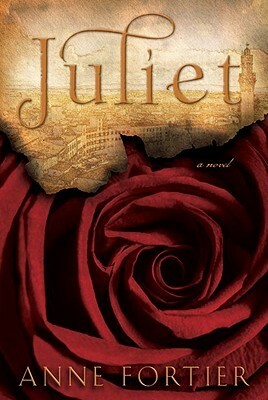 Juliet, by Anne Fortier. Italian-born Julie Jacobs, orphaned with her twin sister at age three, and adopted by an aunt, wanders a bit aimlessly through life teaching Shakespeare workshops for kids. She’s 25 now, and on the unexpected death of Aunt Rose, she is further shocked by the news that Aunt Rose everything to her sister Janice. Their gardener and cook, Umberto, takes Julie aside to reveal that Aunt Rose has secretly left her an envelope containing a key to a safe deposit box in Siena, and clues to her shrouded past. Oh, and her real name: Giulietta Tolomei. The key is her connection to her parents who died in Italy, and a letter from Aunt Rose suggests that a great treasure which she should try to find. Leaving behind her crass, gloating sister, Julie heads to Italy, becoming entwined in her own ‘Romeo and Juliet’ story while discovering family connections she could never have imagined. She’s not sure what the treasure is, but it’s clear that other people are interested in it, too, and the pursuit becomes a dangerous business. The characters leapt off the page at me, and it’s not simply a re-hash of Romeo and Juliet, but a new and interesting story. There are lots of R & J references, though it doesn’t require great familiarity with Shakespeare’s version to enjoy it. I loved the back-and-forth play of the modern story with the historical, revealed as Julie discovers it. There seemed to be some minor issues of coordinating the passage of time in a couple of scenes, but overall, I enjoyed it a lot! BONUS: Maybe you are more familiar with the Goodreads website than I am, but I recently discovered “Listopia” there. It’s under the “Explore” tab on the home page, and when I entered “Italy” in the Listopia search box, I got all kinds of great lists for books about Italy, set in Italy, by Italian authors, and so on. I will definitely use this resource for choosing books to review here, and very likely for other book searching too. Have you used Listopia? Found any great books there? The beautiful language. 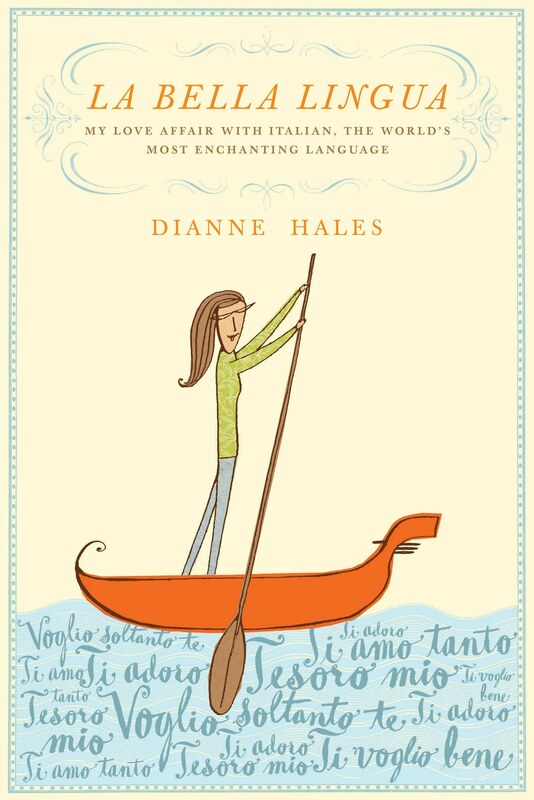 The Italian language is the subject whose story is beautifully told in Dianne Hales’ book, La Bella Lingua. Subtitled “My love affair with Italian, the world’s most enchanting language,” Hales’ book is very thorough in presenting the history and development of today’s Italian. Most engaging for me were the stories of her falling in love with Italian, and the research on the book. Her personal experiences transported me to Italy, and brought me into the room for her conversations with various language teachers and experts, historians, and writers. I also enjoyed learning more about the origins of the Italian language. She definitely prompted me to consider a closer look at Dante, and introduced me to several significant contributors to today’s Italian. I didn’t expect to find Galileo, but there he was. Verdi, Garibaldi, and many others–the famous and infamous–are included. Perhaps food-related Italian words are most widely known in America–and a chapter is devoted to eating Italian. Other chapters celebrate art, love, and cinema, the Italian way. For people with an interest in languages and linguistics, this will be a fun read. For students of Italian, it’s a must. The book includes an index, chapter by chapter bibliography, and a discussion guide with questions. I recommend it! Can I also encourage you to visit Dianne Hales’ website? Many great features will draw you back to it–Italian food and travel ideas, a blog with language learning helps, resources for teachers and students of Italian language, and a nice introduction to Dianne herself. The cover of this book really appealed to me because of a dream I had in 2004. I was in Sorrento, studying Italian for two weeks at SorrentoLingue. About ten days into my two weeks there, I had a dream. I was in a boat, one of the colorful fishing boats found in that area, just me and the boatman. I was fishing with pole and line, but instead of trying to catch fish, I was fishing for words. Ever done that? I would reel one in and look at it, the Italian word I had caught, but it wasn’t the one I wanted, so I threw it back. Over and over, I cast my hook into the water but kept bringing in the wrong word. And there on Dianne Hales’ book cover–aside from the Venetian gondola rather than the fishing boat–I saw my dream depicted. And in addition to the book’s contents, the cover is a delightful reminder of my wonderful experience in Sorrento.